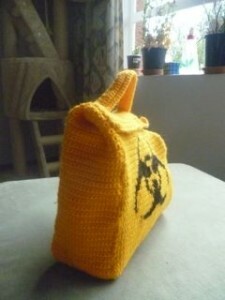 This bag requires yellow and black 8ply wool and a 2.5 mm hook. 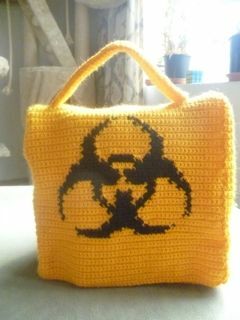 The finished bag is about 25 cm tall. The pattern is written in American crochet notation. 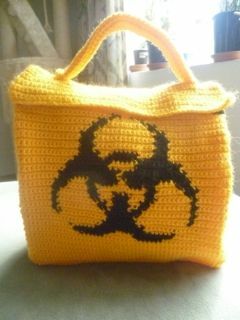 The bag is made in four pieces. 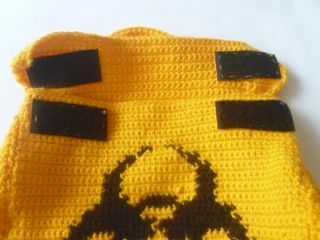 First the flap, back, bottom and front as one piece. Then the two sides. Then the handle. 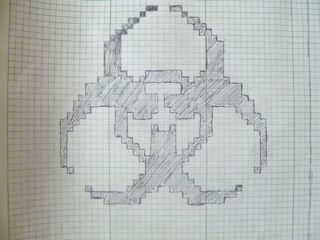 I can’t upload big photos to this website so the biohazard symbol pattern is a bit hard to read. 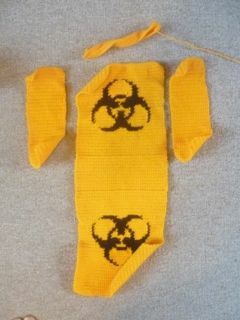 However I’ve uploaded a much bigger and clearer photo onto Ravelry. Fasten off, leaving a long tail for sewing. Fold the handle in half along the line of row 5 (the backloop only row creates a crease) and sew together. Sew the sides and handle to the rest of the bag. Sew some velcro onto the flap and the front of the bag so that you can securely close it.